This supplement for NeoExodus clocks in at 22 pages, 1 page front cover, 3.5 pages of advertisement, 1 page SRD, leaving us with 16.5 pages of content, so let’s take a look, shall we? In the world of Exodus, the elves are a lost and splintered race -struck hard by a biological weapon, they have long since lost their position of supremacy…but in a world of intrigue and world-spanning conspiracies like NeoExodus, that does not necessarily have to be true now, right? Hence, this supplement covers elven subraces (including nomenclature etc. 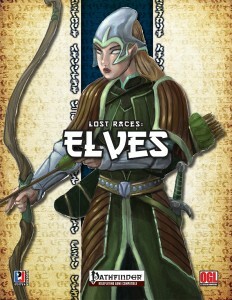 ), beginning with the high elves that pretty much represent the elitist elves that left the world behind – only to return? That’s up to the DM, I guess. Racial stat-wise, they get +2 Dex and Int, -2 Wis,a re fey with the elf-subtype, get low-light vision, +1 to atk vs. First Ones, DR 5/cold iron, +2 to Perception, elven weapon familiarity and 1/day can cast dimension door as a spell-like ability, but with the interesting limitation that it can only drop them in liminal spaces – whether they be crossroads, doorways or the like – interesting and flavorful limitation. Personally, I would have made the DR a scaling option via FCOs or the like, with especially 1st level being otherwise pretty broken for the race – unless you already feature some races in an above average power-curve. As alternate racial traits, they may replace weapon familiarity with +2 concentration when casting defensively. Liminal magic can be replaced with immunity to dazzle effects and blindness based on light-effects, while 10+ Int high elves can cast light at will. Generally, no complaints regarding these exchanges. The race gets a massive array of solid FCOs, including the hybrid-classes from the ACG – no complaints there. Desert Elves would be a bit lopsided in that they get +2 Dex and Con, -2 Cha, being geared towards physical classes more than I like in race-design. They also are fey with the elf-subtype, get low-light vision and DR 5/cold iron. They are more resilient against forced marches etc. incurred by hot (o cold – remember, nights in deserts = COLD) environments and get +4 to stealth while in desert environments and may, as a standard action grant themselves concealment in desert environs. They also get silent hunter AND can make objects from sand as a full-round action. The latter can be replaced by better spellcraft and racial bonuses versus arcane casters and silent hunter can be replaced with +2 AC while in the desert. Once again, the FCOs are nice – but we only get 3 ranger, rogue, slayer. I love the sandshaping, but the race suffers imho from being essentially a high-elf on speed in deserts – much like similar races in 3.X, the race is too strong in its chosen environment and falls into the trap of being very niche-centric -the situational nature of such bonuses don’t really help and I think that the DR in particular should have been reserved to the high elves – here, it only exacerbates the strength of the race. Mountain Elves get +2 Dex and Con, -2 Int, making them also lopsided in my book. They once againa re fey with the elf-subtype, get low-light vision, +4 to resist the effects of extreme cold, are immune to altitude sickness, may ignore natural difficult terrain in mountains (and keep dex-AC when climbing or balancing) and gain DR 5/cold iron as well as a modified weapon familiarity. The alternate racial traits replace moving through natural difficult mountain terrain with cold terrain or gain +2 to AC in a specific terrain. the final trait is baffling: You can replace immunity to altitude sickness and not losing Dex while balancing or climbng with a +2 racial bonus to Acrobatics to cross narrow ledges and to saves versus altitude fatigue and sickness. Wait, what? Where do I sign? Why would anyone take this downgrade? This is pretty much the desert elves, minus the cool, unique tricks of the race. Not a fan. The FCOs cover druid and ranger. Deep Elves would adhere to a similar formula, with their basic attributes not being lopsided (kudos!) at +2 Dex and Wis, -2 Cha and get stonnecunning etc. – I do massively object to constant nondetection (!!!) and meld into stone as SP at lower levels, though I do very much enjoy that this one has a proper scaling mechanism that increases the usefulness over the levels, even granting high-level earth gliding. The race has two solid FCOs – one for Cleric, one for Oracle. Dark Elves are even more lopsided +2 Int, Wis and Cha, -2 Con. They are fey, get darkvision 120 ft. (!!! ), DR 5/cold iron, light blindness, +4 to Bluff-checks to lie, +2 to any Craft skill in which they have a rank, can cast nightmare 1/day at character level = CL, +2 to saves versus diseases, ingested poisons and becoming nauseated/sickened. They also suffer from light blindness and get supernatural alter self as a standard action for character level minutes, providing a +10 racial bonus to disguise – and the ability allows you to go for small size. As a further downside, exposure to sunlight potentially petrifies these guys. The shifting can be replaced by planar ally to summon daemons at 1st level and +4 Diplomacy versus them and the Bluff-bonus can be replaced with Poison Use. This race is severely bloated – so many small skill-bonuses accumulating with superb senses and too many powerful spell-like abilities render this race broken in my book, even in high-power games. Additionally, the shifting ability should be SP in my book. The race has two solid FCOs for alchemist and sorceror. Planewracked Elves are perhaps the most modular of the elves – beyond the basic traits à la DR, low light vision etc., they can select from a theme like chaos, umbral, etc., representing the plane upon which they have crashed – they receive scaling bonuses versus spells and effects associated with the plane, a defensive bonus and a 1/day SP, ranging from entropic shield to burning gaze. Know what’s kind of odd? Though this is the most modular of elven races herein, this represents perhaps one of the best-balanced herein and one I’d potentially allow in my games – minus the DR, of course, but you probably have guessed that by now. No FCOs for the planewracked, alas. The pdf also sports archetypes, the first of which would be the charioteer for the cavalier, who gets a chariot at first level and…wait…I have this odd sense of déjà-vu…but no, this one is different from Flying Pincushion Games’ charioteer, granting you options to prevent damage to the creatures drawing your chariot and is all about ramming – effective size-increases makes the focus here pretty much linear. What’s nice is that we get a chariot-themed order here – though the order’s second ability, which allows you to add free combat maneuvers to full attacks, should probably specify whether they still provoke AoOs and improve upon the text to make it a tad bit more precise. The Desert Viper Slayer can study opponents as a move action…and at 7th level, they can study opponents as a move action…wait, what? Well the 7th level upgrade also makes it possible to study foes as a swift action, allowing for more control over action economy. Apart from that poison use and anti-caster feints are okay, but nothing to write home about. Dream-Eater witches must have either nightmare or dream prepared as spell or hex to heal herself by feasting on dreams or providing a buff, with the ability scaling with the levels and replacing a total of 3 hexes. Other than that, this archetype is okay, if not revolutionary – were it not for one thing – it fails the bag o’ kitten test -while the healing gained is less efficient, since hexes have no daily limit, one can heal infinitely until one runs out of kittens. Earth’s Scion is a Brawler with solid anti bullrush/trip-etc.-tricks and double damage versus object and AoE-trips at higher levels – solid. We also get a new material type with desert glass, which may be subject to nasty sonic damage, but it can be enchanted more easy for certain enchantments – nice! Elven Bronze is also introduced. 5 new racial feats allow for more uses of liminal magic’s dimension door (allowing others to follow through with another feat), longer lasting shad-crafted items, desert glass crafting and a teamwork feat that allows for ritualistic casting – the feat is pretty powerful and could use a slight rephrase: One of my players misread it the first time around, as the cap the feat imposes is only mentioned in one of the uses of it – RAW, the other use is uncapped, which would translate in potentially very nasty abuse scenarios obviously not intended. The pdf concludes with two cool, magical arrows as well as the elixir of stolen dreams, ending on a definite high note. Editing and formatting are good, though some obvious cut-copy-paste errors have crept in, some of which unfortunately influence the ability to properly understand the crunch. Rules-language, as a whole, shows Jeff lee’s aptitude for providing concise crunch, so not much to complain in that regard. Layout adheres to LPJr Design’s two-column full-color standard for NeoExodus with quite a bunch of absolutely glorious original full-color artworks. The pdf comes with a second, more printer-friendly version and is fully bookmarked for your convenience. This pdf is in a tough spot with me. I loathe “terrain-races” – you have this cool, hostile terrain with all the requirements to survive – and instead of making it a matter of smarts and adaption, you get races that are strong in that terrain and ignore its key difficulties. In my book, that was never and will never be good design – I hated it in Frostburn and Sandstorm etc. and still loathe it. That being said, I did NOT expect to actually like some components of the desert elves, who actually get some unique tricks. DR 5 for all base races herein is too much for my conservative tastes, but that could be still appropriate for some high-powered groups, even though the races herein surpass what I’ve seen from comparable NeoExodus-races. Generally, I think the races could have used a bit of a nerf. The dark elves are broken, but that is somewhat offset by the planewracked eleves being pretty cool as well as with the genius liminal porting ideas of the high-elves and the neat sand-sculpting. The archetypes beyond the racial write-ups are pretty much solid and fun, even though they’re not always perfect. The item-section was my favorite herein, while the feats once again proved to be a mixed bag. I usually tend to love Jeff Lee’s work, but here, I just wasn’t that blown away – but granted, that may very much, at least partially, be due to me considering DR 5/cold iron at first level pretty broken and loathing terrain-races – in my book, they are pretty much the epitome of bland race-writing – though the fluff, while not copious, at least partially manages to save them. Still, all in all, I am just not 100% sold on this supplement. It has some cool concepts and ideas, but even when trying to abstract my personal tastes, some issues remain. So I did what any good reviewer should in the face of an obvious personal bias and ask for help – my gaming group read through my printed out copy and ultimately, the consensus came down as this not being a bad supplement by any stretch, but also as one that did not elicit awe from them. It was considered, generally, to be solid, if slightly flawed. My final verdict will hence clock in at 3.5 stars, rounded down to 3, with the caveat that you should round up if you like terrain-specific subraces and/or don’t mind the power-level and few balance-issues. You can get this mixed bag of racial options, oscillating between brilliant and…not so much, here on OBS!